The combination of 1-1/2 hp, 10 rpm gear motor and telescopic drive shaft will open any car gate that is not damaged or ice-bound. Instead of using one-directional, high torque hammer action, the Powerdrive relies on the instantaneous reversibility of an electric motor to "rock" the stuck gate open. The drive shaft angles 20 degrees in all directions and telescopes to reach varying socket positions.The gear motor's double shaft allows two-tgrack gate opening. Powerdrive assembly includes gear motor, drive shaft, controls and fittings. By adding the optional Sliding Carriage (4020-11) the Powerdrive can work its way down a line of gates. 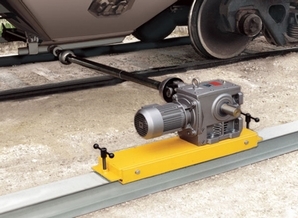 With the optional Sliding Carriage, item number 4020-11, the POWERDRIVE can work its way down a line of gates.